It is with great sadness we farewell highly respected Chinese artist Chen Shaoxiong who recently passed away in Beijing after a long illness. 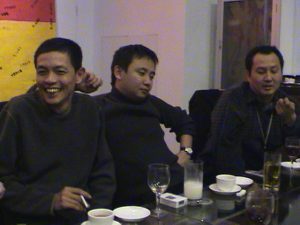 Shaoxiong exhibited with MAAP in several exhibitions and was highly regarded for his extensive contribution to contemporary art in China, particularly in the development of video and media art. Chen Shaoxiong was born in Shantou, Guangdong province, China, in 1962 and graduated from the Guangzhou Academy of Fine Arts in 1984. Chen was a founding member of the “ Big Tail Elephant Group” of conceptual artists in Guangzhou in the 1990’s. He worked independently and collaboratively as a member of the tri-national artist collective called “Xijing Men” as well as another Chinese artist collective called “Project without Space”. His work was featured in the Venice Biennale 2003; Guangzhou Triennial 2005 and Shanghai Biennale 2002. His works have also been exhibited in PS1 Museum, and the International Center of Photography in New York; the Victoria and Albert Museum in London; Kunsthalle Bern in Switzerland; Mori Art Museum in Tokyo; Hamburger Bahnhof in Berlin and Tate Liverpool. The largest solo presentation of his work to date was on show from June to September 2016 at the Powerstation of Art, Shanghai and curated by Hou Hanru. Other solo exhibitions include the Spencer Museum of Art, University of Kansas, 2012; a solo show at the PARA/SITE art space, Hong Kong, 2008; and participation in the Gwangju Biennale 2012; National Art Museum of China, Beijing, 2009; Aichi Triennale 2010, Nagoya, Japan; and, the 10th Lyon Biennale, 2010. Chen is a 2013 Rockefeller Foundation Bellagio Creative Arts Fellow.